One of the certainties of dying empires and collapsing civilizations is an increase in violence of all kinds; from organized to unorganized, state and non-state based, small to large scale etc. As a logical outgrowth of this trend I expect Australia's military to both increase in size (even if it's only relative to the economy) and importance both domestically and internationally. Since the military will need drastic retooling and is likely more willing to undertake practical steps to prepare in the face of overshoot than most institutes (the US navy is willing to pay $400 for algae biofuel). As it stands, militaries often have a major role in creating technologies (including organizational tools) that then spill over into the civilian world. From that, I think one of the overlooked options for adaptation is fostering a technological/social change from within the military alongside more mainstream organizations. Besides its both a challenge and one of the ultimate tests of quality design, military equipment has to perform optimally under a variety of adverse conditions. So, the key challenge for militaries that will be looked at here, is that of adapting their physical stock of goods and their support network (which includes manufacturing) to an overshooting world and to the post-peak world. Importantly, the changes that will happen will be from a certain perspective minor but from others major, it's also incredibly easy to overstate the effects they'll have. Militaries will still use guns, it's quite likely for automatics to survive (machine guns certainly will), and vehicles (when around) will still have the same overall design (that doesn't mean they won't be different, likely they'll be smaller, slower and lighter). Navies on the other hand will change their main method of propulsion to sail, but their armament will still include guns (a few missiles will likely exist) and chances are they'll still be mono-hull, have radios and computers inside them, probably mechanical like the dreadnoughts of old did. It's harder to guess how aircraft will go, here the change is likely to be drastic; from ultralight solar planes, more airships and a variety of new designs (here's an example), though they'll still use guns, bombs and missiles/rockets. So it isn't a complete overhaul of the armed forces, not like what happened when guns superseded swords (though it should be noted, that change took centuries), this is simply adapting and changing what already exists to a different context. The smaller details will change (and these matter), of logistics, manufacturing, performance, reliability, maintenance and so on. The overall strategies and tactics in which the equipment is used will change in response, which will drive shifts of their own alongside the increased difficulty of logistics. And military equipment is placed under far more adverse conditions than civilian equipment is and with overshoot the conditions will probably get worse with less wealth available for maintenance. So a big driving force will be the necessity of making the equipment easier to maintain, produce, support logistically and still function under high stress conditions (This is an area is which Russia is much more prepared for than the US and is one of their traditional strengths). Then their is the whole array of the equipment cycles, the manufacturing, disposal, material life-cycles and so on, along with new design trends/ideas (such as integrative design) that are partly driven by overshoot, including ones that aim to increase material efficiency/productivity. One of the most important elements of the (modern) military is logistics. How do you feed, cloth, equip, house, move soldiers and their equipment and so on, without this no action can be taken and the military falls apart.With fuel supplies dwindling and economies contracting, all aspects of logistics will become harder and any military action will become more difficult and as a likely result leading to the use of smaller military forces than currently used (whether they will also be 'lower tech' is more uncertain). The problem is, gun based armies require more support (even war bands and raiders have this problem) than sword based armies but reverting is only an option if no one else has guns. So armies will shrink by necessity (also due to other factors such as budget and manpower shortages) alongside creating a driving force to optimize logistics, cutting what's sent logistically and producing equipment that requires less support. It'll be an interesting engineering challenge, since by it's nature logistics requires a whole systems thinking to simplify (since it is a system rather than a component), but it has to contend with the fact that each component has to operate at a high performance under stress. One of the insights behind whole systems thinking is that optimizing parts in isolation can be counter-productive to optimizing the system, so those are not exactly aligned goals. Another area that needs to be looked at is manufacturing since this area does determine quite a bit about the military. One area, that merges with logistics, of preparation would be preserving the metric system since it drastically simplifies logistics while increasing the output and reliability of manufacturing. Before a standardized measurement system, the factory that each cannon came from had to be tracked, since only parts and ammo from that factory could be used for that cannon, yes it was a major hassle which is why militaries drove standardization. So focusing on this area and keeping the advantages of current industrial practice should be a focus for military preparations. If this is done, then it will be simple to have different manufacturing systems working alongside each other, such as (wind or hydro powered) factories, local blacksmiths and the in-between systems. Otherwise, pushing for more domestic manufacturing and for those industries to adapt, militaries can have quite a bit of influence in that regard, is another major preparation. Biomimicry is an area that could easily yield impressive improvements for the military (and civilians as well, but more on that later) and its a fairly broad area, but I'll simply talk about the material side of things. To give you an idea of the impact this field could potentially have, body armor is currently significantly more complex and expensive than weapons so it would be straightforward to assume that body armor will disappear or become even more restricted. But artificial nacre (mother of pearl) can now be mass produced, though it lacks some of its natural counterparts traits, and artificial spider silk is now in production and CSIRO is looking at artificial bee silk production, all of which could bring down the expense of body armor. Standard materials follow whats known as the 'heat, beat and treat' model for production, which is very expensive energy wise, while bio-materials can be quite tough while using relatively miniscule amounts of energy. A similar transformation would happen in the chemical industry if a cheap way to copy or design enzymes is ever found, suddenly ammonia could be made at room temperature at a high rate allowing a pseudo-industrial agriculture. So suddenly body armor has become cheaper than weapons or not that much more expensive, possible even in a post-peak future. Importantly, these materials aren't dependent on petrochemicals and are often made from fairly common substances and with energy requirements that could easily be supplied by renewable energy. The idea of copying natural materials but producing them in a non-agricultural setting is a fairly recent idea, serious attempts started around the 1980s through it's probably older than that. What's happening now is that the conceptual & prototyping stage is ending and the implementation/commercial stage is starting, these are decade long processes so it will at least take 10-20 before the replacement of conventional materials becomes remotely noticeable. And entering military service could take even longer since the materials have to prove themselves and have a solid production base. The fact of overshoot will either increase that time, or halt the process. In practical terms, if the military wants to capitalize on the possibilities of biomaterials, starting some long-term projects in the next 10 years would be the best bet. Success means that quite a lot of advantages appear, such as ultralight tank armour that could radically reduce heavy tanks fuel consumption, or something similar with planes. Obviously, this is a long term project and while one of the key attributes of biomaterials is their incredibly low energy consumption, building the production capacity to satisfy military needs will be costly enough so any advantages for the civilian world will have to wait for a stabilization period to be fully realized. The other aspects of biomimicry should also be looked at. Whether it's looking at how fish swim to improve water based transport, copying man o'wars to make unmanned surface vehicles or how mussels dig to radically improve (100x more efficiently) the digging of offshore platforms. All of those are current projects, there are many more in the pipeline and even more that are possible. They simply have come a bit late and could use the sort of R&D capabilities the military has demonstrated in the past since what's going to be lacking in the future is the capital to implement these changes and replace current stocks with these new materials and processes. One of my books mentions a new impeller based on natures spirals that is 30% more efficient than the best practice today, the main problem with implementation is simply building the production capacity and replacing everything. Same with phytomining(also known as biomining), it's a great ecotechnic technology but without massive effort, it will take a long time for it to filter throughout the mining sector. Militaries have shown the ability to develop these sort of technologies, and they do offer the promise of helping ease us along the downside of overshoot. Now, the problem with developing these advances in an overshooting era is that even if their perfectly viable and developed, the ability to create & distribute them is limited. So even if the military successfully develops and deploys them, chances are they won't spread into the civilian world as fast & comprehensively as previous technologies have. Their simply won't be enough factories, resource and so on. So even if synthetic silk becomes cheap (energy wise included), most people won't have access to it. Mind you, once the process of overshoot is finished and the human world has recovered this won't necessarily be true and it is worth attempting simply for the chance that the future eco-technic societies can have these benefits. Inevitably, equipment breaks down (or is shot at) and needs to be either repaired or discarded and replaced. For consumables (food, ammo, fuel etc), that can only be discarded once used, so most concerns are in reducing their consumption or finding better storage techniques for transport. The big concern which has only been looked at fairly recently is what happens after a product has been used, the end of it's life-cycle. Here the ideas of cradle-cradle and upcycling are important, since they deal directly with the end phase of a products life-cycle and what comes next. First their is the separate technical and biological nutrients, the first cycles through the techno-sphere endlessly (ideally) while the other can disposed of safely into the biosphere (say via composting). They need to be easy to separate, so components will normally be either entirely technical or entirely biological nutrients, but hybrids are quite possible with proper design. So most military consumables that are used in the field should be biological so they can safely be left in the ground or alternatively used for bio-energy. If on the other hand the containers can be easily kept, they should be easily refillable and the possibility of using technical nutrients should be looked at, especially if they could be used in the bases machine shops. There's a whole lot more but this should be the starting point for anything which is going to be disposed of instead of repaired, though this will still be a secondary consideration to capability. 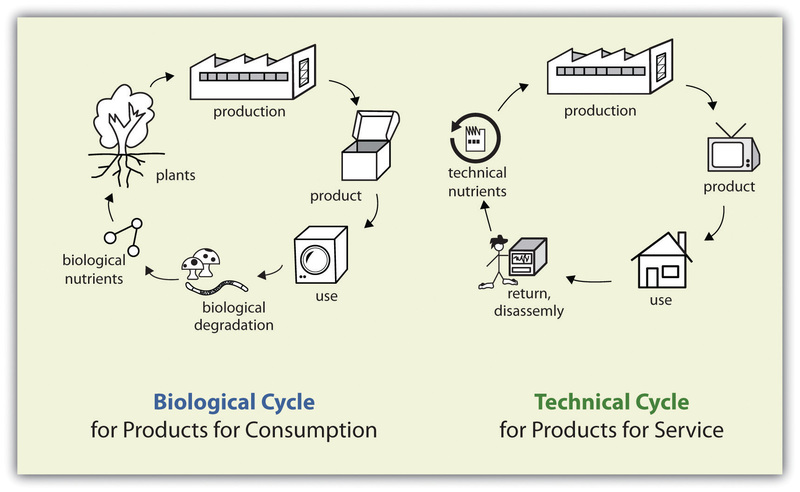 An example of the segregation of biological and technical nutrients is exhibited by the books Cradle to Cradle and its sequel Upcycle. The first book is a Durabook, which are made from plastics and uses a special ink. Basically its tough, waterproof, has no adverse affects on the enviroment or health and can be continuously recycled, it is simply melted down and the ink skimmed off before reuse. The book Upcycle is an entirely biological nutrient, it contains no toxic materials at all and is completely compostable, you could leave it on the ground and its materials would safely assimilate into the enviroment. Logistically speaking, biological nutrients are easier for an army to dispose of for most field consumables (they can simply be left on the ground at worst). Otherwise most equipment will be only technical nutrients with some hybrids. Dealing with the military equipment which needs to be repaired is another issue. While I don't know enough about military equipment in detail, I imagine that most of the good practices are used. Having easily swappable parts, building in durability and so on (some of these were pioneered by the military). Here the main principle is figure out how best to simplify equipment without too many tradeoffs, and when tradeoffs need to be made where the balance lies, so that repairing is both simpler and quicker. Having shared components, even when it creates inefficiencies, could also be useful as it simplifies inventories and allows for both more and easier scrounging. Otherwise it's as simple as making equipment (ranging from tanks to guns) easy to take apart and replace parts as necessary, though a provision for fixing the parts (like a base workshop) should be considered. Radical redesign probably isn't needed, most of the equipment could easily look and function similarly to modern counterparts and while there will be a lot of work involved, most of it will likely be in the production chain, smart redesign and material choices. the best case is that capabilities are actually enhanced, through the most likely outcome is a they are party; reduced. The other issue with repairing equipment is who repairs it and how are they trained/accommodated into the military structure. Military bases in friendly areas could rely on civilians for some of the repairs, making use of local blacksmiths or workshops, but this obviously doesn't work if their not in friendly territory, their are no civilians (at least ones with the relevant skills) or the base is in a war-zone and everyone else has left. The best case would be the soldiers repairing their own equipment with hand tools and simple machines, that's quite achievable for most of the equipment a soldier carries but won't always be possible, shovels and radios are easy enough, aiming lasers, not so much. So chances are any bases that have more complicated equipment (vehicles of any kind for example) will have dedicated technicians and full-scale workshops. Smaller bases could potentially benefit from 3D printing and similar technologies in that regard. So, that's an initial look at military equipment. There are quite a few more topics, but this is enough for now.